Looking for more Chevrolet Silverado 2014-15 Lighting products? Contact us for a customer package with a special package price. If your looking to outfit your new headlights with ultra bright and ultra reliable headlight bulbs, ask us about Outlaw Lights LED Headlight kits or HID Headlight kits. BRAND NEW for 2014-2015 Chevrolet Silverado - RECON's Highly Anticipated Projector Headlights with New Cutting Edge Ultra High Power Smooth OLED Halos and Daytime Running Lights! 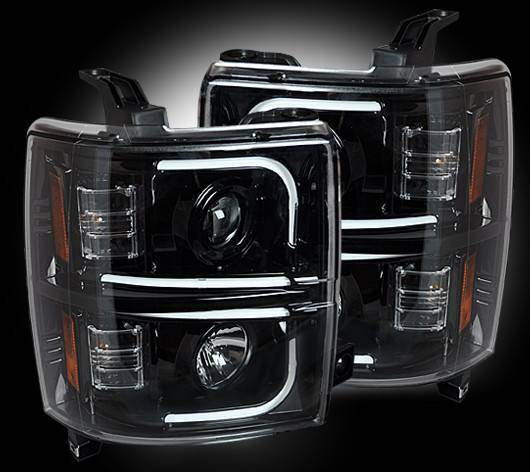 These 2014-2015 Chevrolet Silverado RECON Projector Headlights with OLED Technology are sold as a set & use H7 Style Headlight Bulbs for the Projector Low-Beam and H1 Style Headlight Bulbs for the High-Beam. 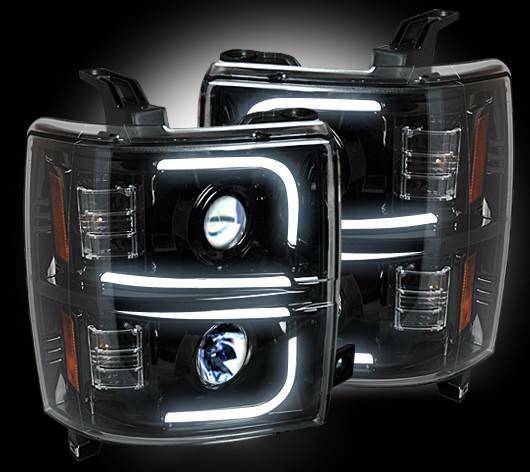 RECON projector headlights come with 4 standard halogen bulbs already installed; however, we also have ultra bright LED headlight kits and HID headlight kits available.